More summer goodness. I do believe I have taken advantage of summer's bounty more this year than any other summer since I first started going to the Green Market eleven years ago. That might be due to my newly-reconditioned air conditioners that have kept my apartment cooler than my old unreliable ones were able to do. That has made the summer more bearable, but I am still happy to feel the weather changing. Fall is definitely right around the corner. But until it comes, I have started stockpiling some of summer's goodness in the freezer, for use when I have had one too many rutabagas and am longing for a taste of summer freshness. To that end, I put together a batch of marinara sauce using fresh San Marzano tomatoes I found at the Leaning Shed Farm, which has become one of my favorite stands at the Green Market. They have the widest variety of heirloom tomatoes and peppers, and some killer garlic. They are now the first place I head as soon as I hit the market. I didn't know that they can officially call them San Marzano tomatoes, since the ones that come from San Marzano, Italy, are D.O.P., but I guess they can, as long as they don't pretend that these are the genuine Italian tomatoes it's ok to call them San Marzanos. 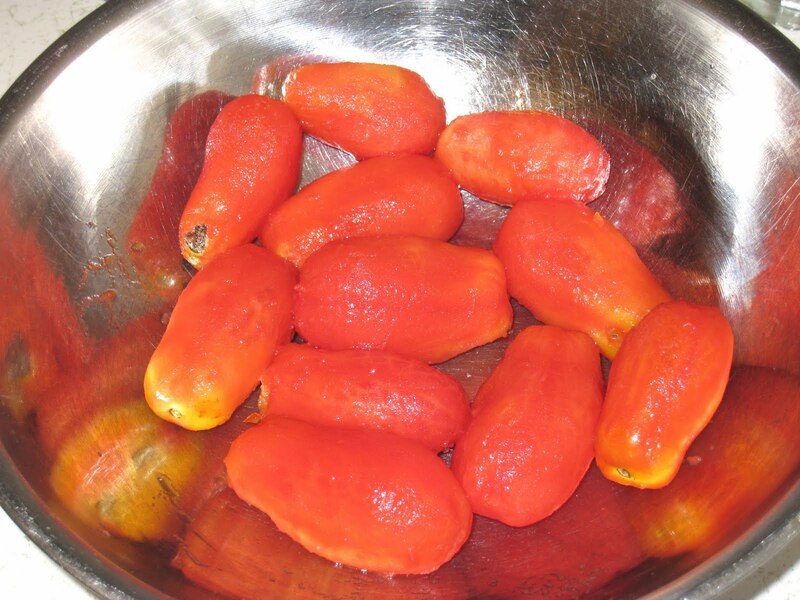 They are similar to a plum tomato, but smaller, and have a more intense, sweeter flavor. Last week they had something called Super San Marzano tomatoes, which looked just like the San Marzanos but were just a little bigger. They were the most luscious deep red, so those are the ones I bought that day. I made a lovely Marinara sauce that served as a delicious base for pizza (just the sauce, some garlic, and mozzarella and parmigiana reggiano - scrumptious!). I wanted to get more so I could make a batch or two to freeze, but by the time I made it back to the Green Market this weekend (darn those family visits!) they were out of the supers. But they did still have the regulars so I gt those instead. 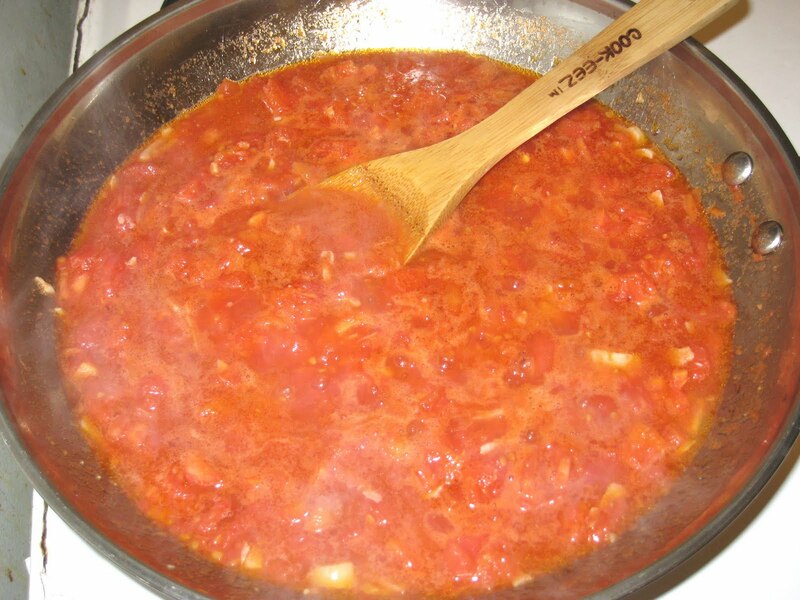 I am all for opening up a can of tomatoes and whipping up a tasty sauce in the middle of winter, but I have to say, there is definitely a difference using fresh. The only way I can think to describe it is that you can taste summer. 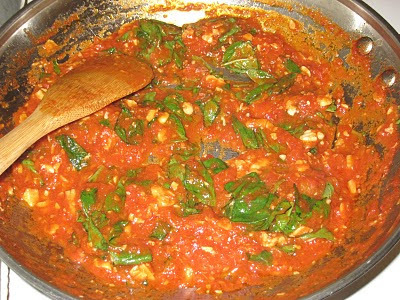 The sauce is bright, fresh, and you get a more intense flavor without having to cook it down quite so much. Right now I have two jars in my freezer. I plan to have more by the time the tomatoes are gone. Which will be all too soon, I know. 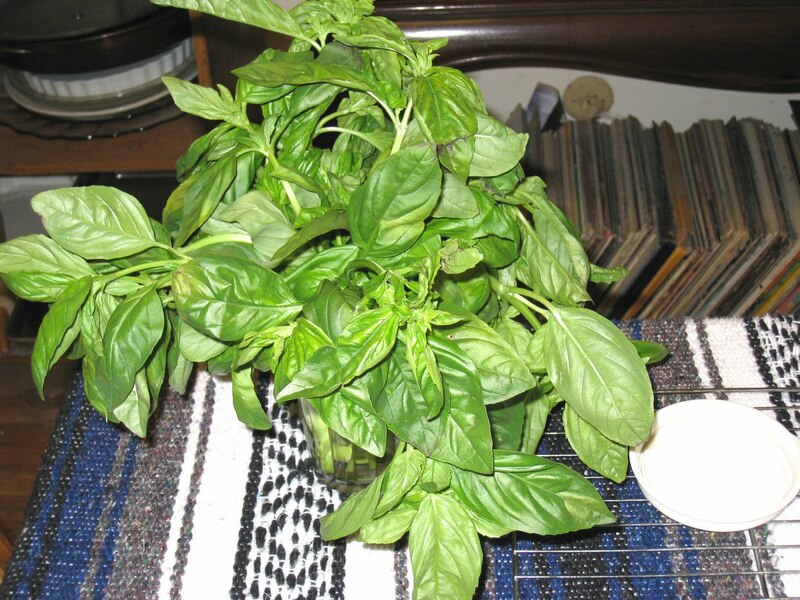 First, make sure you have plenty of fresh basil on hand. 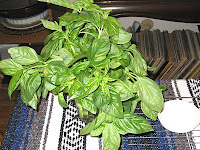 The potted basil I bought for myself did not make it through the summer, so I bought this big bunch of green at the market for two dollars. It was more than I needed for my sauce, so I have plans for a batch of pesto that will go well with pizza or pasta sometime down the road. If I had been thinking faster, I would have taken pictures of the tomatoes before I started the sauce, but I was halfway through chopping them when I decided to start snapping pictures. This is about half of what I started with. I cut an x in the base of each one and dropped them, about 6 at a time, into a pot of boiling water and left them for about 15 seconds. Then I took them out and dropped them into a bowl of cold water. After that, it was easy to peel off the skins. And then it was short work to cut off the stem end and chop them. They are quite meaty and do not have too many seeds, so they were not as messy to chop as the bigger, more round varieties tend to be. 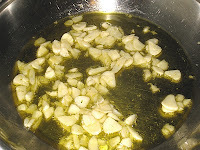 To start the sauce, I thinly sliced 6 cloves of garlic and put them in a large skillet with olive oil. I turned the heat on low and let the garlic heat up with the oil so it would cook without browning, or burning. Usually, I believe you would then take the garlic out of the oil, leaving behind just the flavor, but I like garlic too much to do that so I left it in. 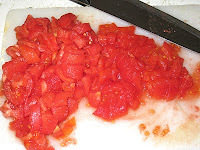 While the garlic was cooking I was chopping the peeled tomatoes. This is the first half that I had chopped before realizing I wanted to take pictures. My chopping board is on the small side and I couldn't fit all of the tomatoes on it, so I raised the heat on the skillet and added these first, giving them a good stir, and then I finished chopping the rest of the tomatoes and added them to the skillet. At this point I seasoned with salt and a little freshly ground pepper. I also added a pinch of sugar after tasting it. These tomatoes were a little more acidic than the supers were. This is what it looks like when the tomatoes have first been added. Even though the tomatoes are not terribly juicy, they turned liquid soon enough. It never looks like they are going to cook down, but I just lowered the heat and let them simmer for about 45 minutes, until they were nice and thick. I turned off the heat and stirred in a generous handful of roughly chopped basil, then I tasted for seasoning and added a little more salt. The sauce can be used right away, or frozen for future use. Hey, Dejamo! Can we add a link to your sauce recipe on the leaningshed.com recipes page? Hi, Lou. Yes, you are welcome to link to my recipe! And thank you for stopping by my blog.